Any Italian will go insane over this cheesy Ninja Foodi Lasagna dip! This is the perfect dip for your game day parties, weekend entertaining, and days you just want a treat. 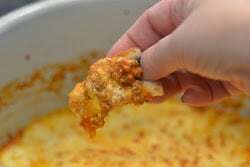 Warm cheesy meaty lasagna dip served with crusty Italian bread or better yet garlic bread. 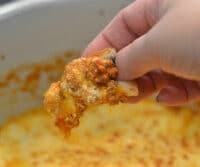 Rip off chunks to dip into the lasagna dip. This dip is everything you love about lasagna without all the hard work of a lasagna. It is football season and every weekend I have been serving a variety of game day snacks. I am pretty sure it is because I love party snack food. Each dish has been as delicious as the last. This Ninja Foodi Lasagna Dip is so delicious I was having a hard time pulling myself away from it. That is the true question I think we all want answers to! 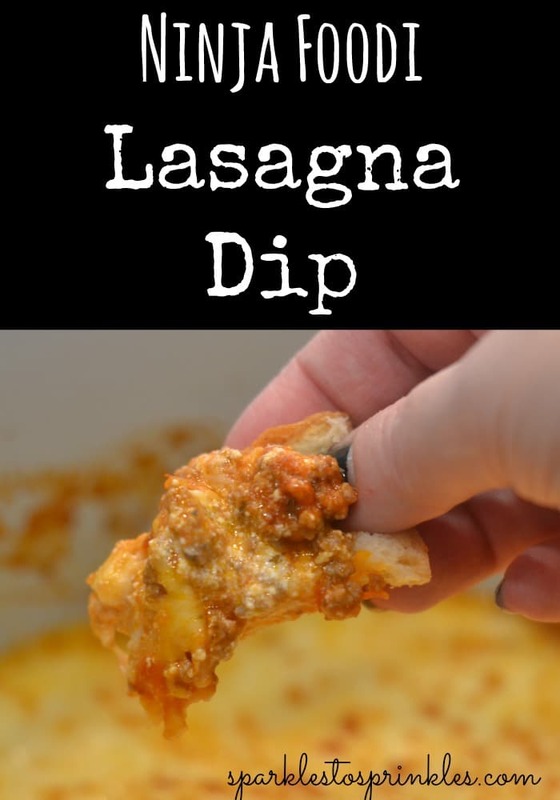 I love all the variations below and feel free to drop a comment on what you would reach to dip this glorious and cheesy lasagna dip in. Yes! I used jarred spaghetti sauce because it is easy and speeds up the prep. But, you can always use homemade sauce if you prefer. It will add even more dimensions of flavor for sure. You sure can. I prefer the creaminess of ricotta cheese, but you are welcome to replace it with cottage cheese if you have a preference. I am happy to say this lasagna dip does reheat nicely. 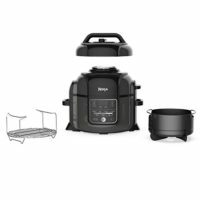 You can toss it back in your Ninja Foodi to reheat, or oven or even microwave. If you do the microwave just cover it, or you will get splatters everywhere. I have uItalianlian sausage and ground beef before for my lasagna dip and both work well. So you can pick between the two, or if you are feeling lucky use both. Using Italian sausage and ground beef will really add such dimension and flavor to your dip, that will rock your world. As you can see this Ninja Foodi lasagna dip is versatile. You are able to play with the ingredients to use exactly what you like to get the dip of your dreams. Once you make this, I guarantee it will become an instant favorite. Plan that get together and have this lasagna dip at the top of your list. Friends and family will go nuts for this incredible dip that is not only delicious but so simple to make. The most delicious Ninja Foodi Lasagna Dip that is the perfect comfort food dip for any celebration. Add ground beef and saute until browned. Add spaghetti sauce to the ground beef and stir to combine. Saute until fully heated. Place large dollops of ricotta cheese on top of beef/sauce mixture. Carefully smooth and spread out to cover the beef/sauce mixture. Sprinkle shredded mozzarella cheese over the top. Spread it evenly. Air Crisp 6-8 minute until mozzarella is fully melted and starting to get a nice and toasty.